How can you not like a spa that hands you a flute of champers the minute you walk through the door? The lounge in this glimmering glass DTLA high-rise is a glam dream with soft lighting and oodles of mod white and gold. Plus many of the good-smelling scrubs and rubs are harvested from the hotel’s rooftop garden. TRY THIS TREATMENT: The Champagne & Shimmer Body Treatment. It includes a champagne seed scrub, a hydrating massage, and a dusting of 24-karat gold powder. Yeah. You’re gonna want that. Indulge in a massage and spend the day at this gorgeous, nature-centric resort by the sea. 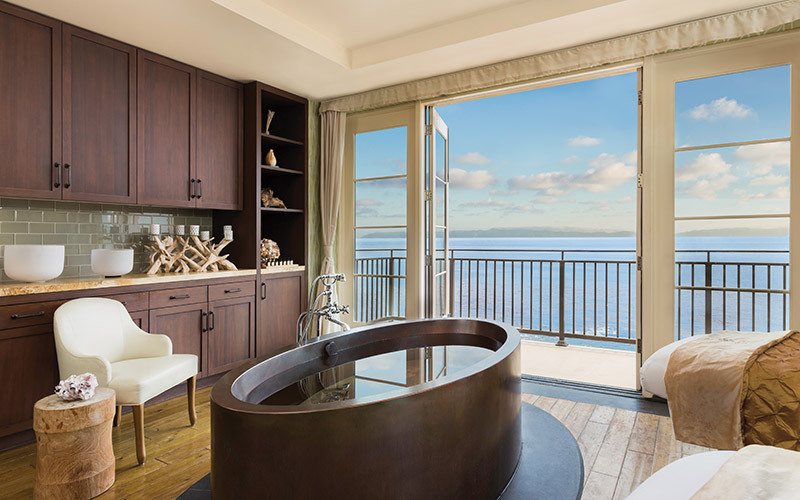 The 50,000-square-foot spa has some of the best amenities around, including a salon, saunas, a cafe, and a huge pool that overlooks the ocean. The last time we were there lounging on a chaise, two passing whales got close enough that we made eye contact. TRY THIS TREATMENT: The Ocean Prelude. It includes a dry brushing, seaweed wrap, saltwater bath, and warm laminaria oil massage. TRY THIS TREATMENT: The Aromatherapy Body Massage. Because plant essential oils make everything better. DTOX is another boutique option located on busy Los Feliz Blvd. As soon as you step past the lobby, you enter a tranquil waiting area presided over by waterfalls and some serene deities. The award-winning spa opts for natural products and services. TRY THIS TREATMENT: A Custom Facial. The therapists know their business, and their business is your face. Ok, so this is in OC, but it’s only about an hour’s drive away, and it’s totally worth it. Set high off the Pacific, Pelican Hill is acres and acres of quiet lushness overlooking the ocean. The amenities are top drawer (we could live in their ginormous bubbling whirlpool), and you may never want to leave the waiting area with its cozy blankets, teas, and spa snacks. TRY THIS TREATMENT: The Terra Stone Massage. Why? It’s 80 minutes. 80. Nothing will beat the holiday aches out of you like the masseuses at this ladies-only spa in Koreatown. Welcome to a world that includes a Himalayan salt sauna, a large heated jade floor where you can nap, and a Mugwort tea bath. The spa café serves tasty Korean dishes like bibimbap and seaweed soup. It is a busy place—visiting on weekdays or evenings is recommended. BYO flip flops. TRY THIS TREATMENT: The Pure Bliss Treatment. First you’ll enjoy their signature Akasura Body Scrub followed by a deep tissue massage, then an essential oil scalp massage, and finally a facial massage with chamomile mask. Oh, and they wash and condition your hair. If you can make it past the large gift shop (it’s a good one), you’ll enter a luxe space designed for lingering. There’s a co-ed mineral pool in the atrium along with Turkish steam rooms and redwood saunas in both the men’s and women’s locker rooms. The fireplace in the lounge is a nice touch. TRY THIS TREATMENT: The Beverly Body Rescue. Deep pressure. Detoxifying oils. Check. Check. Kari Mozena is the Special Projects Manager at Los Angeles magazine and LAMag.com. You can follow her on Twitter and Instagram. She wrote Here’s Exactly What To Do In L.A. If You Are Staying In Town Over The Holidays. Next articleBREAKING: This is the Best Time of Year to Go Tidepooling in L.A.